It’s Independence Day in India today, my second one since arriving here, and a national holiday. I’ve now been here for 1 year and 8 months. Assimilation is probably too strong a word, but I joked that I was fully assimilated when I bought a pressure cooker for my maid to use a few weeks ago. 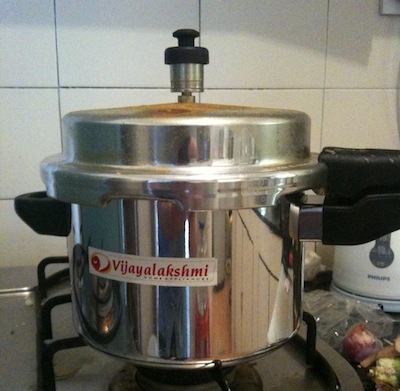 I had never used one before, but the communal hissing of pressure cookers joins the sound of grass or twig brooms sweeping tiled floors as a candidate for “Essential Sound of the Early Morning in India”. Anyway I noticed in the last couple of weeks that life in Bangalore now feels very “normal”. I am pretty much used to the way everything works, so much so that I don’t really notice the idiosyncracies of Indian life any more. I’m not taking photographs of everyday things so much, either. Talking to students and local colleagues is no longer such an adventure in negotiating Indian English, although I do occasionally stop and ask whether certain idiomatic phrases are used or not. I now know to say “co-ordinate” instead of “liaise” — I learned early on that nobody has a clue about that one here, and that nobody will tell you that they don’t know what a word means. I now say “garbage” instead of “rubbish”. When I ask the auto-driver to take me to “Wipro Park”, I pronounce it with a “V”, and so on… everyday stuff you just pick up by osmosis, so you can make yourself understood. I’ve also noticed that I’ve started to pick up expressions used by my students which I hadn’t come across before. For example, “As in?” signifying “How/what do you mean?” is one that I hear all the time and it has insinuated itself into my brain, even though I don’t particularly like it. I somehow got into the habit of pointing using my whole hand, with the fingers together, since pointing with one finger might be considered an aggressive gesture. I always hand money to people with my right hand rather than the left, after the telling-off I got from an auto driver shortly after arriving. All this stuff is automatic now. Anyway, something that’s much harder to put into words is that generally I no longer feel like I am “other” or different from everyone else. I felt a little self-conscious wearing a kurta in the shopping mall yesterday (we had a “dress ethnic” day in college), but otherwise it doesn’t seem to occur to me any more that I am different, even when I’m the only light-skinned person in the whole place, which happens a lot. Or I suppose it does — I don’t notice any more. I realised that I don’t really think of my students or colleagues as being Indian any more either… which might be because I know them all really well now, or because I’m used to the local ways of speaking and doing things. Anyway, I feel at home here. And I am accustomed to the many contradictions and contrasts of everyday life here, which I have written about many times, and which you will also read about in all the guidebooks. It seems to be one of the things that defines this country. We would achieve independence in the true sense only when we are able to banish poverty, illiteracy, hunger and backwardness from our country. More than 1 lakh [100,000] new villages have been provided with electricity connections under [the Rajiv Gandhi Rural Electrification] scheme and now almost all the villages in the country have been electrified. Our next target is to provide electricity to each and every household in our country in the next 5 years and to also improve the supply of electricity. Recently the Cabinet has approved the Mars Orbiter Mission. Under this Mission, our spaceship will go near Mars and collect important scientific information. This spaceship to Mars will be a huge step for us in the area of science and technology. The world’s biggest democracy (which recently had the world’s biggest power-cut) is struggling to provide electricity to more than two-thirds of its rural population. A third of the people of India live below the international poverty level of $1.25 a day. 35% of females and 18% of males are illiterate. And child malnutrition is 2nd in the world only to Bangladesh. All of these things were mentioned in the PM’s speech. In this context, spending money on sending a probe to Mars seems a completely ridiculous contradiction. But like I said, I was hardly even surprised by the announcement.